Flood your room with the abundant natural light of our gorgeous garden windows! 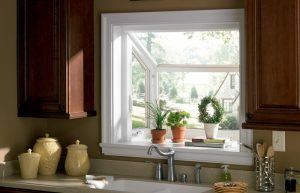 Whether you want a spot to grow herbs and other small plants or you just want to add a little charm to your kitchen, Atlanta garden windows are a great addition to your home. Don’t trust your new window installation to just anyone—call Greater Atlanta’s most dependable window replacement company! Since 2004, Tight Line Exteriors has built a rock-solid reputation for providing quality products, professional installations, and exceptional customer care. Our long-standing BBB accreditation and professional affiliations are further testaments of our commitment to customer satisfaction! Because these windows project away from the home, garden windows flood the room with natural light. Side vents, usually operated by an easy-to-use crank handle, allow lots of fresh air into the space. Replacement garden windows provide a place for year-round gardening, or you can add optional shelves to display small collectibles. We’re your trusted resource for Atlanta replacement windows and other home improvements, so contact us today to learn more about our superior services. Give Tight Line Exteriors a call to chat with a member of our team, or fill out our online contact form to schedule your free, no-obligation estimate!